Any chef will tell you that there is no substitute for proper knife skills as the foundation for all other cooking skills. We’ve been offering this powerhouse class since we opened in 1998 and interest hasn’t waned one iota! In this class, you’ll learn all about knives that are right for you. 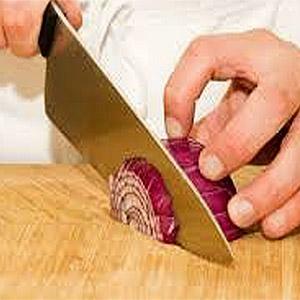 In addition, you’ll explore sharpening, storage and other important information, plus learn cutting techniques like chopping, dicing, batonette, cubes, julienne, chiffonade and more. You’ll receive some important hands-on experience under the supervision and tutelage of Chef Richard McPeake. This is a must for all of those serious about cooking! Please note that alcoholic drinks will not be available during this class. If you plan to attend this class with another party who signed up separately, please add their name(s) to the INSTRUCTIONS/COMMENTS section of your online registration so that we can seat you together; otherwise we cannot ensure that you will be seated together for the class. If you register for multiple students at one time, that registration will prompt you to supply the names of all students you are registering and we will know to seat you together. Thank you!